Lincoln Casino Review | get the most recent updates! When a name like Lincoln is mentioned, what strikes your mind may be the founding fathers of the United States. However, our Lincoln is a classy online gambling platform, designed with the finest graphics and creativity. The casino has been offering US players with a wide variety of games from WGS Technology including table and cards, video slots and poker since 2013. The games are available in download version and instant play version. Players who choose Lincoln Casino enjoy multiple currencies, banking options, and bonuses. If you are the kind who love jackpot games, Lincoln casino has a good number of different variants such as Reel Poker Slots, Ultimate 10X Wild, 7x Lucky 7s, Mega-Money Mine, Pay Dirt, Red, White and Win, Triple Wild Cherry. Lincoln Casino is powered by WGS Technology, a reputable developer for excellent games. The software is available in instant play and download casino software and it is compatible with mobile phones like Android, Blackberry, Windows, and iOS. The games have been developed in HTLM5 which enables them to be accessed in browsers. The interface is attractive and easy to navigate through different options. 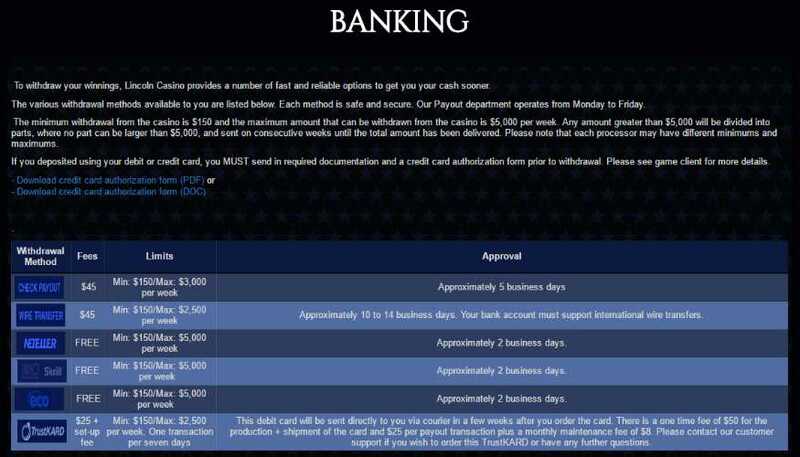 Bonuses and promotions are the best ways of attracting online players. Lincoln casino uses generous welcome bonus of $5000 which is spread on the first five deposits. There is a reward program that is tied on the loyalty program, not mentioning the comp points for all players including US-based gamblers. The casino is licensed by the Curacao eGaming and all games are tested independently for fairness and random results. It also employs the latest 128-bit SSL for all its data encryptions. Lincoln Casino has been delivering unapparelled customer support service since its establishment. The agents are available 24/7 on Live Help, Email or Phone.